Type Of System:Cat-Back Exhaust System Tube Size: 2.5 in. 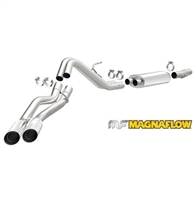 Retains Catalytic Converter: Yes Type Of Material: 100% Stainless Steel Outlet Type: Dual Exit Location: Same Side Exit Exhaust Tip: Stainless Steel Tip Size: 3.5 in. Muffler Included: Yes Muffler Type:Straight Through Muffler Material: Stainless Steel State Legal: 50 State Mounting: Includes Mounting/Hangers Other: Mandrel-Bent Pipes Lifetime Warranty, Dyno Tested And Proven To Make Power, Performance Gains In Horsepower And Torque, Great Sound -Has A Smooth; Deep Tone, Easy To Install, Mandrel-Bent. All Welded. Built To Last. 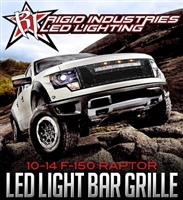 The Rigid Industries LED grille for the 2010-2014 Ford F-150 Raptor provides extra lighting while maintaining a clean mounting solution. This unique new grille features one 30" RDS-Series LED Light, and and exclusive Rigid Industries Grille Emblem.